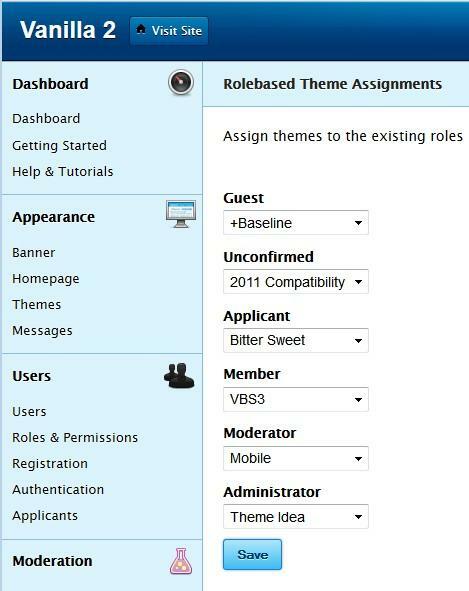 Allows assigning a different theme to one role. Might not work as expected for users with more than one role. I've tried creating a new theme but was annoyed that I could either look at my work in progress or look at the default theme (in order to play around with some plugins or something like that). Everytime I had to go to the dashboard and switch the theme. That might not be the best solution, because it is role based and if a user has more than one role, you can not rely on it to work. But it works for me and it might be of help for somebody else. I have only tested it with Vanilla 2.1b2 and V2.1b3 but I expect it will work flawlessly with Vanilla 2.0.18, too.